Cardio 4 Crafting Friday is Ba-aaaaack! 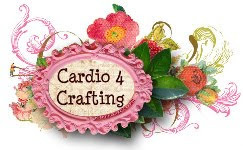 For every 20 minutes of cardio, you get 1 hour of crafting. Every Friday you can check in with a link-up about your progess or a comment. Sound good? Good! Now get off the computer, give it everything you've got for 20 minutes and then come back here and brag about how amazing you are. You can do it! I can do it! Let's go! Running with Glitter also has a Happy Healthy Me link up for more motivation! I have the 30 day JM DVD.. I need to start that tonight! Thanks for the reminder! I'd love to lose 3 pounds this week! I'm 148 and want to be 130 so we are on the same weight loss path.... WE CAN DO IT! I love this idea and can't wait to join in!